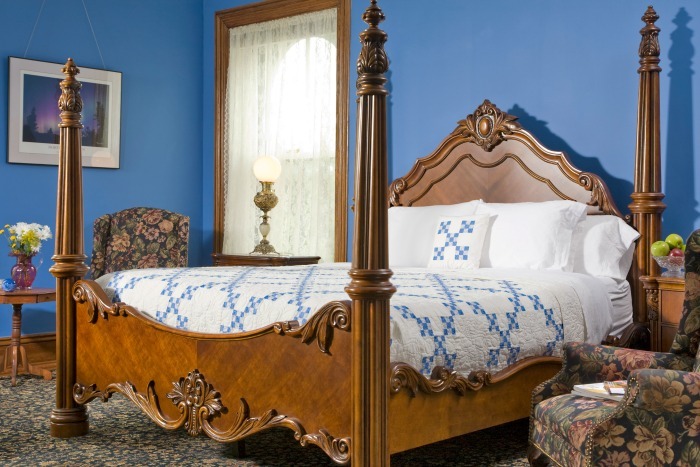 The Carriage House Inn Bed and Breakfast in Lynchburg, VA is delightfully charming and a place of relaxation and beauty. I could go on and on about the beauty and charm of this Victorian Era home but the pictures speak better than any words I can write. Upon our arrival we were given a tour of the home and the owner shared with us the history of the home and graciously answered all our questions about it. 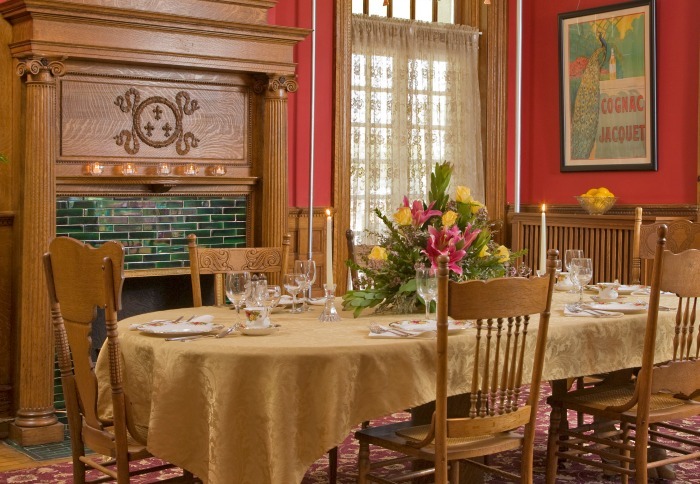 My husband is interested in architecture and home improvement so he wanted to know all about how the house was restored and transformed into the beautiful place it is today. We stayed in the RT Watts room which would have been the master room when the home was used as a single family residence. The bedroom and adjoining bathroom were very spacious. Let me tell you about this beautiful bed. I had the best night sleep ever! It has a sleep number mattress so you can adjust the firmness to your liking. Not surprisingly my husband and I chose different settings. I just loved our room although every room we were able to tour would have been just as wonderful. I will admit this was my first stay at a bed and breakfast and I will also admit that I am sold on this style of accommodations. Our room, and the whole house for that matter, was impeccable. Every detail was attended from fresh baked cookies upon our arrival, to turn down service with chocolates on the pillow, to the most delicious breakfast I think I have ever had. Seriously, I am not exaggerating. Breakfast was nothing short of phenomenal, 4 courses including fresh orange juice, hot coffee and wonderful company. The first course was a strawberry banana smoothie shot followed by cup of yogurt mixed with fresh raspberries. The next course was fresh blackberries served in an orange bowl. 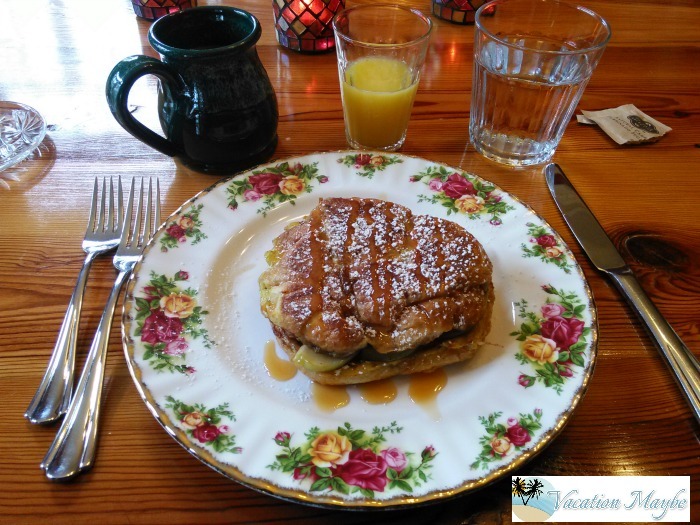 The final course was apple stuffed croissant french toast drizzled with caramel and served with cinnamon infused maple syrup. Heaven on a fork! 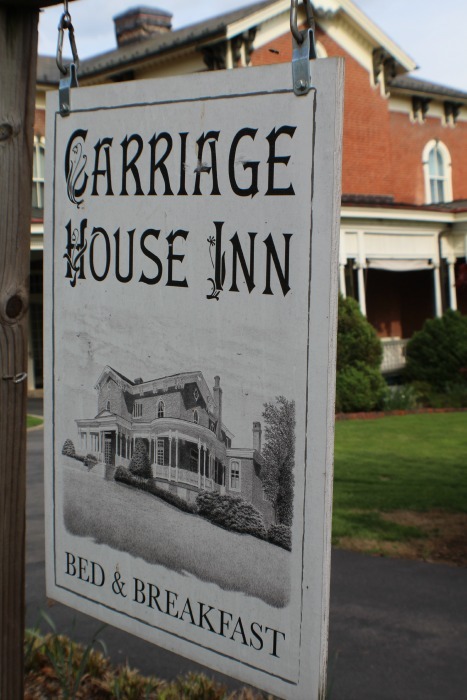 We loved our stay at the Carriage House Inn Bed and Breakfast and will stay there again should we find ourselves in Lynchburg, VA. Be sure to check out all the special packages offered. There is something for everyone and they all sound lovely to me! If you plan a stay, please tell Kathy and Mike hello from Vacation Maybe!